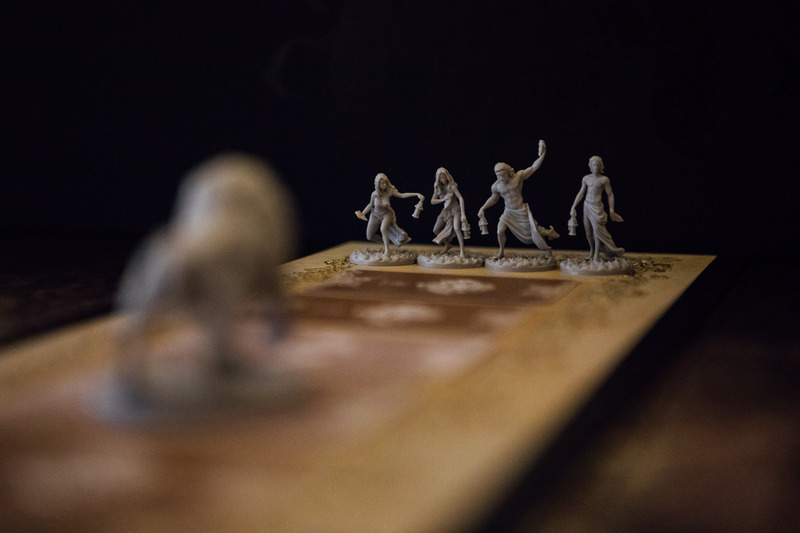 Things – as things are wont to do in Kingdom Death: Monster – have escalated. What began as a throwaway demonstration of the prologue is showing all the signs of blossoming into a fully-fledged campaign. Perrin, after an eventful time in the prologue, decides to hang back from the next hunt and stays next to the Lantern Hoard to contemplate his existence, gaining +1 understanding in the process. The good people of Edmond’s Field, despite being peckish, decide to bury Rand after his heroic but rapid failure rather than cannibalising him. The settlement expands, building a skinnery, bone smith, and organ grinder (seriously, think about that for a minute). 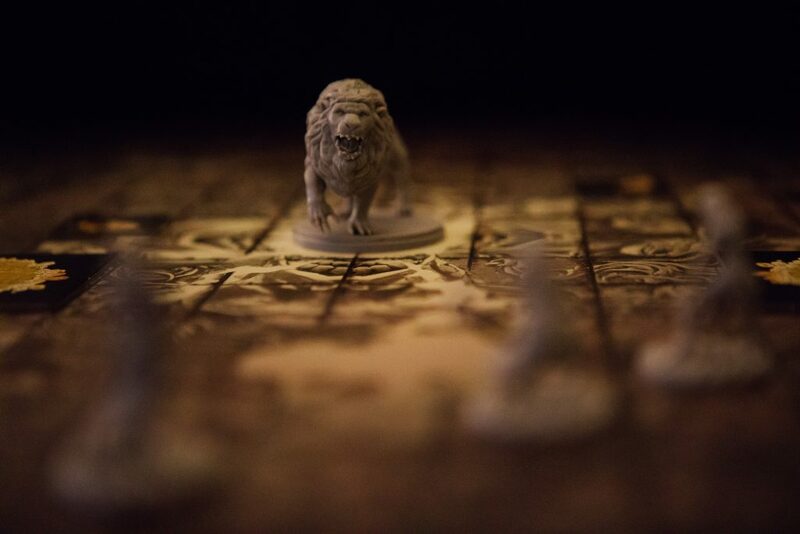 Although the majority of the White Lion’s resources are kept back until a Catarium can be built, there’s still enough to craft some rawhide headbands and bone weapons (a dagger, darts, and an axe). Logain Ablar and Matrim Cauthon join the fight, and before you know it, it’s time to go out looking for a fight again! Our survivors quickly encounter a Sea of Golden Grass, Logain leading the way and everyone growing in courage for following him in. But what’s this? Cresting a hill, they encounter a statue of a man sitting atop a throne. Logain does what anyone would, reaching out to touch it, and immediately taking the statue’s place, dying instantly. 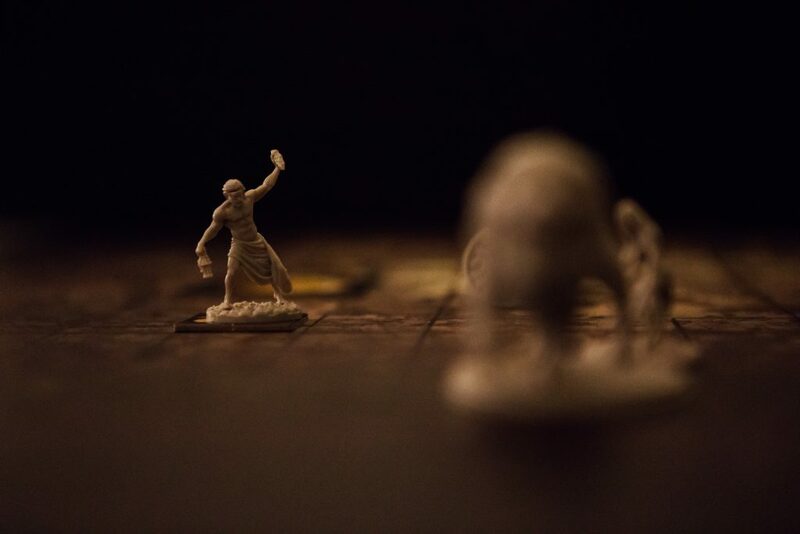 In his place is a new survivor who joins the party without a word of explanation. Dave the Statue has two random disorders (traumatised and hoarder), and is an axe specialist. It was nice knowing you Logain, for a whole three paragraphs. 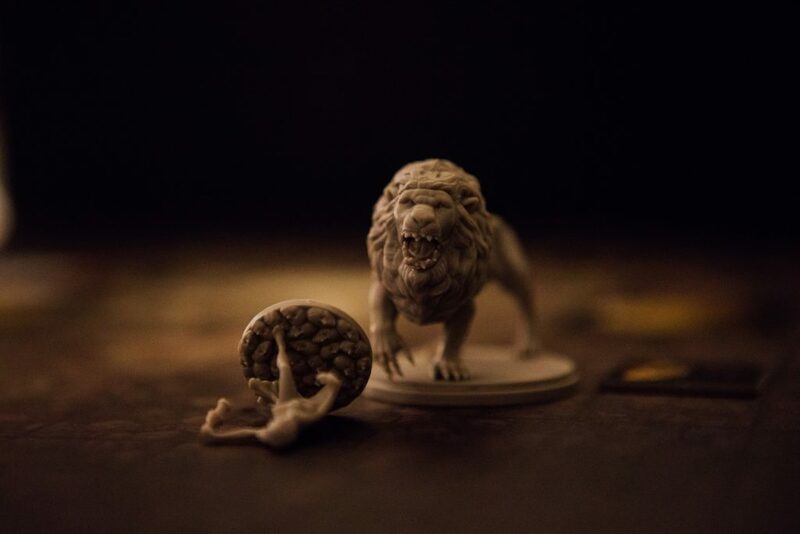 Matt comes across a lion sculpture that gives each survivor greater understanding (and +1 insanity). 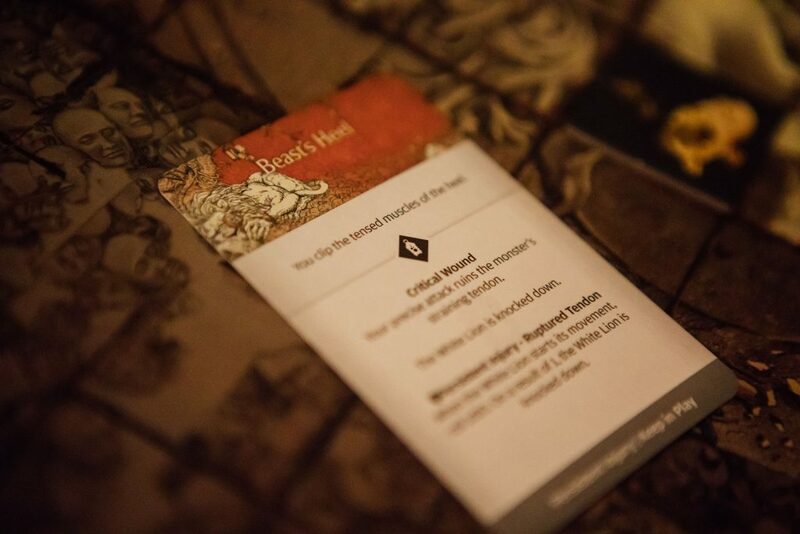 Unfortunately, this signals the arrival of the Harvester. Ever seen Tremors? A giant worm erupts out of the ground and each survivor has to spend 1 survival point to not be eaten alive. 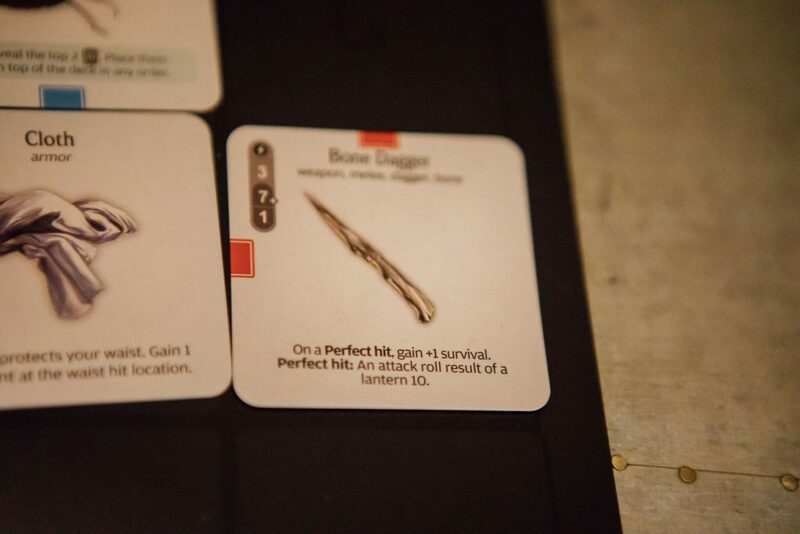 Each survivor also gains a disorder card. What a lovely day out! Elayne really lucks out by leading the hunters in a visit the Saliva Pools. 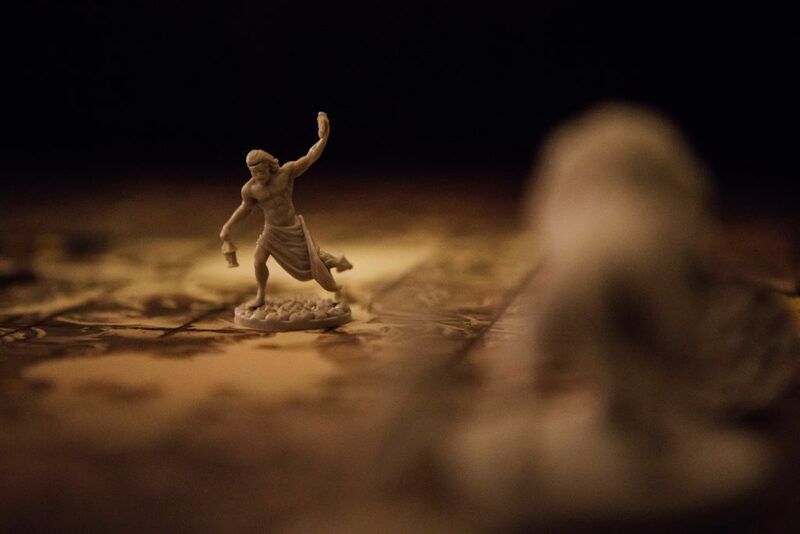 Each survivor suffers a point of damage to the body, but does at least grow in understanding, which leads Egwene to become a better explorer. Appropriately enough, Egwene finds the quarry and they move on to the SHOWDOWN! Monster: CLAW – Matt is first in the headlights, as the Lion moves to him and damages his body and arms. Given the damage caused by the saliva pools, and the encounter with Kevin Bacon’s nemesis (the worm), Matt is in no position to do much about this and is immediately knocked down. 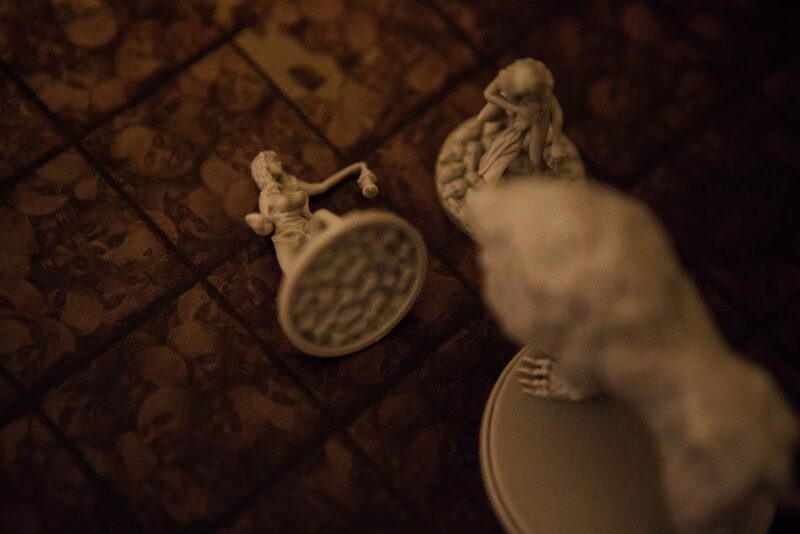 Egwene moves to the blind side and attacks with her brand new bone axe… missing completely. 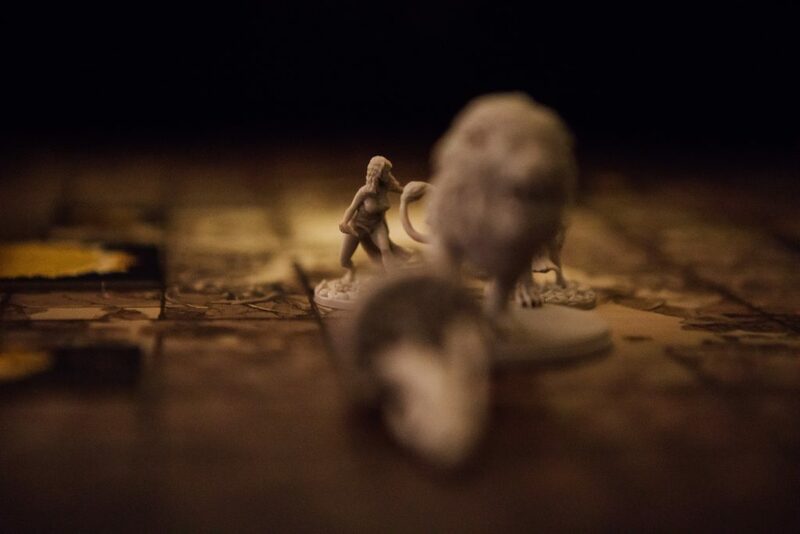 Elayne follows her to attack with her speedy bone dagger, hitting but failing to wound the Lion. This causes the Lion to leap away, colliding with Matt and knocking him to the edge of the board. 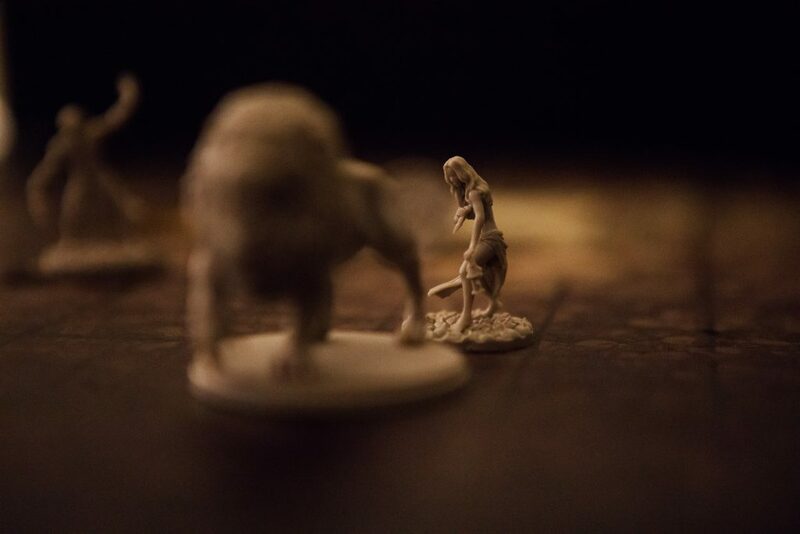 Statue moves to the tall grass to snipe the Lion with bone darts… but misses. 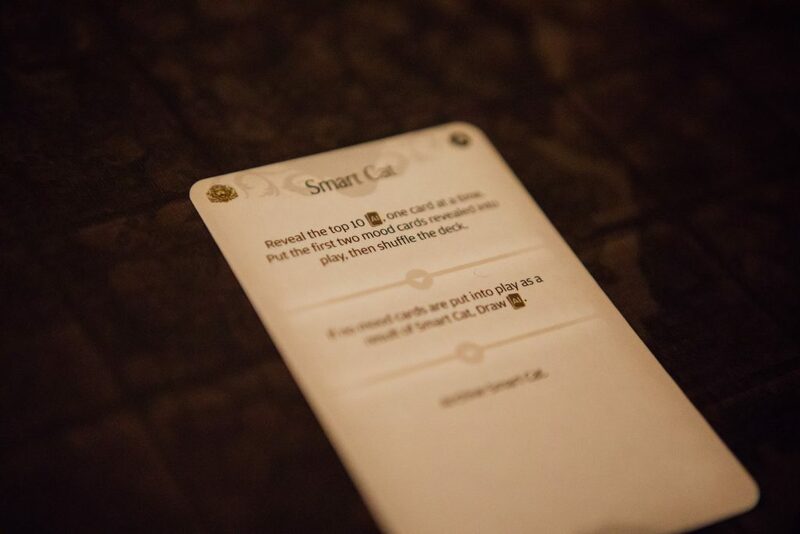 Monster: SMART CAT – the Lion becomes Enraged (giving him +1 damage until he kills or relieves someone of a limb. 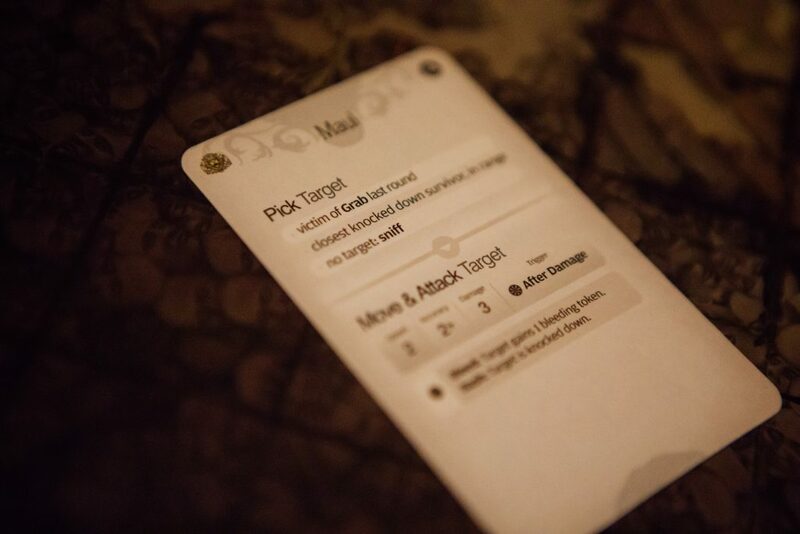 Shouldn’t be too long then) and then draws another AI card: MAUL. Matt is on the receiving end of this… he is first disembowelled, and then decapitated. Matt then dies. Statue moves to a nearby Acanthus plant and after seeing his colleague disembowelled and decapitated, decides to do a spot of gardening – gaining +1 survival which he promptly spends to encourage Elayne to stand up and get on with it. Elayne moves to the blind side and hits the Lion three times! 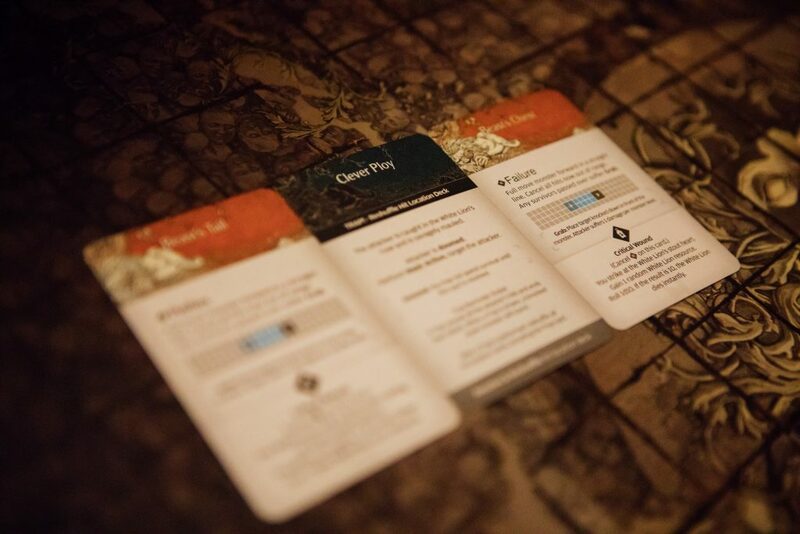 …one of which turns out to be a trap, thus cancelling all other hit locations. 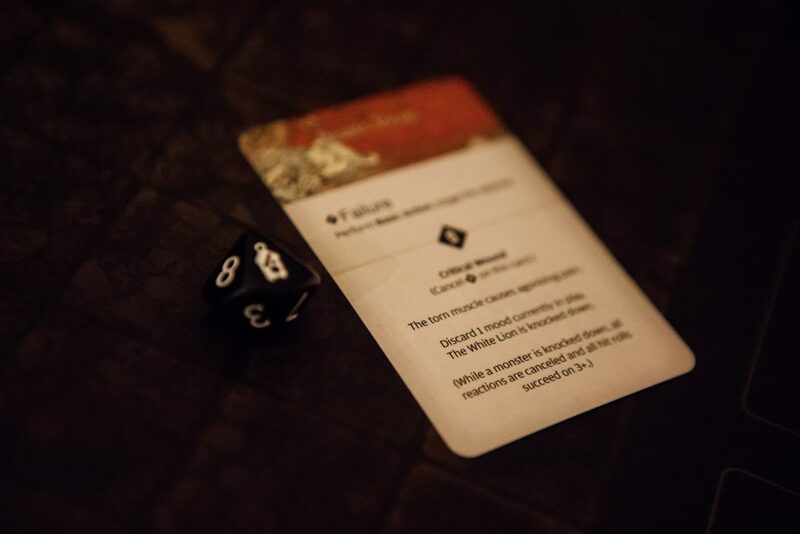 The trap Dooms Elayne (meaning she can’t spend any survival) and the Lion promptly attacks her twice, knocking her down and causing all hit location cards to be reshuffled. 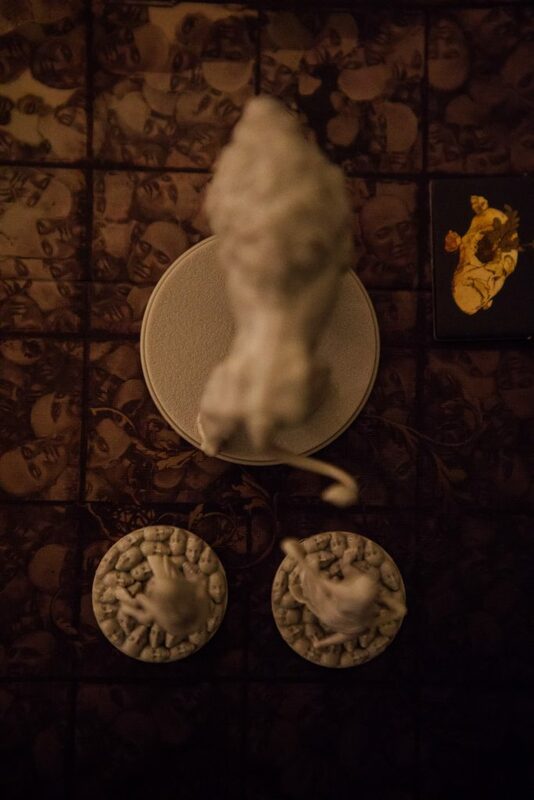 Monster: SIZE UP – Elayne is targeted but the Lion rolls a 3 and does bugger all. Not the strongest turn for Mr Lion. Egwene moves to the blind side and scores a hit with her axe. Perfect positioning. Nothing bad could possibly happen here… why are you laughing? 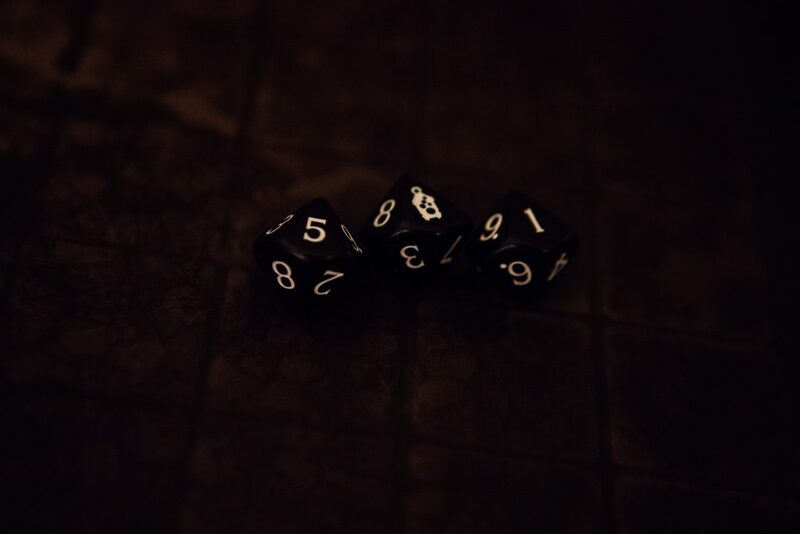 She rolls to wound.. and gets a 5. Not enough, you might think. But wait! The axe has +3 strength, meaning it’s still enough to wound! Axe, I… I think I love you. Statue moves one space away from the Lion to throw his bone darts but misses again. To make himself feel better, he spends more survival to get Elyane back up. Again. Elayne moves to the blind side… and hits! Monster: REVENGE – the Lion heads to Elayne, as the last person to hurt him. 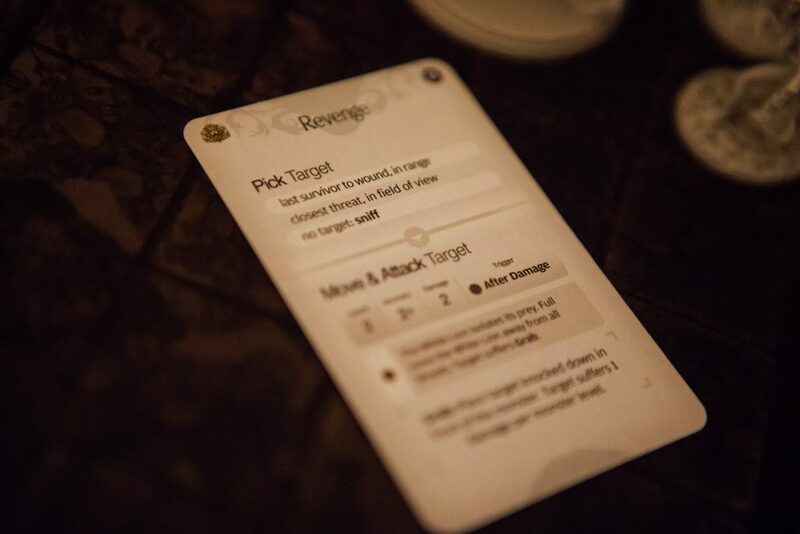 Statistically, a card titled ‘Revenge’ is not that likely to be helpful to the target, is it? Two heavy hits to the head and leg later, she is again knocked down and dragged off into the dark! 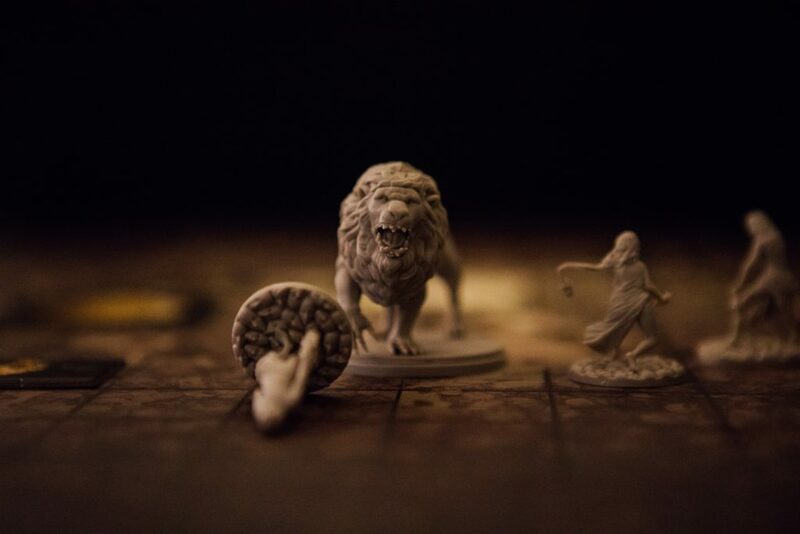 Egwene flanks the Lion but fails to do anything with her axe. Statue keeps running with his theme and misses with his bone darts but encourages Elayne back onto her feet. Yet. Again. Elayne moves to the blind side, attacking with her dagger and hitting twice, including a PERFECT HIT! Monster: MAUL – back to Elayne, which was inevitable. She is Perrin reborn. 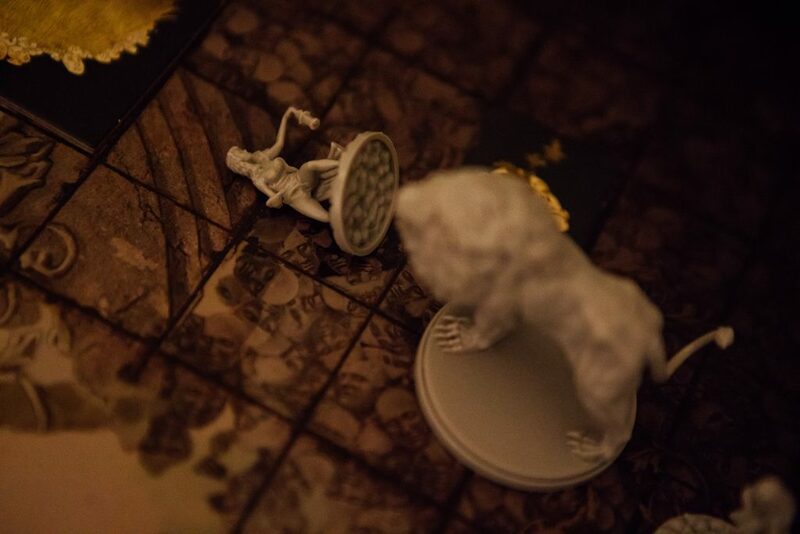 Somehow one of the Lion’s attacks actually misses, and Elayne immediately spends the survival she gained last round to dodge the other blow (avoiding a roll on the serious injury table). In a moment of madness, the bleeding that didn’t actually occur because she wasn’t injured (which we only realised AFTERWARDS) causes her to fall down again… making her also frightened of nearly bleeding, we suppose? Egwene moves to the blind side, attacking and wounding the beasts’ straining neck. Statue moves so he is diagonal to the lion, hitting the Lion but failing to do any damage. He then picks Elayne back up, who seems to have spent this entire fight lying down. Elayne moves round to the blind side, and fails to wound the Lion’s soft belly. 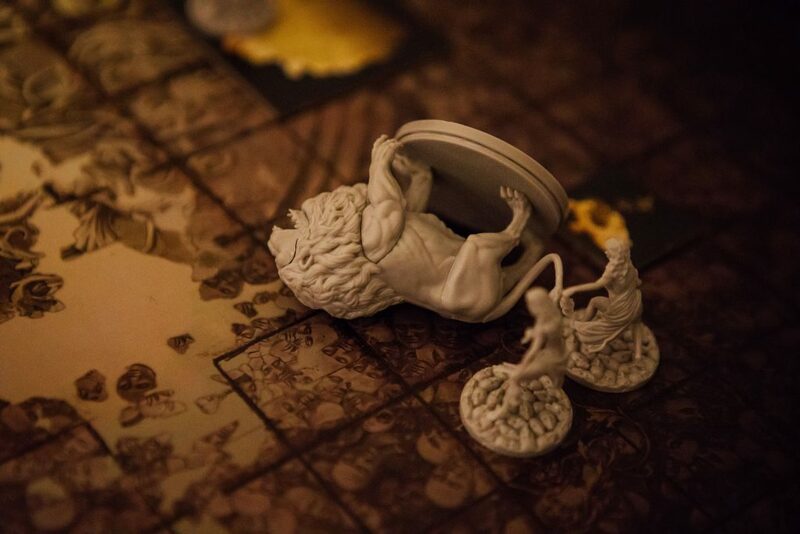 Monster: SIZE UP – this time it’s the Statue who gets attacked, suffering brain damage. Elayne moves to the blind side, fails to wound the beast’s ear, and sends it leaping away. 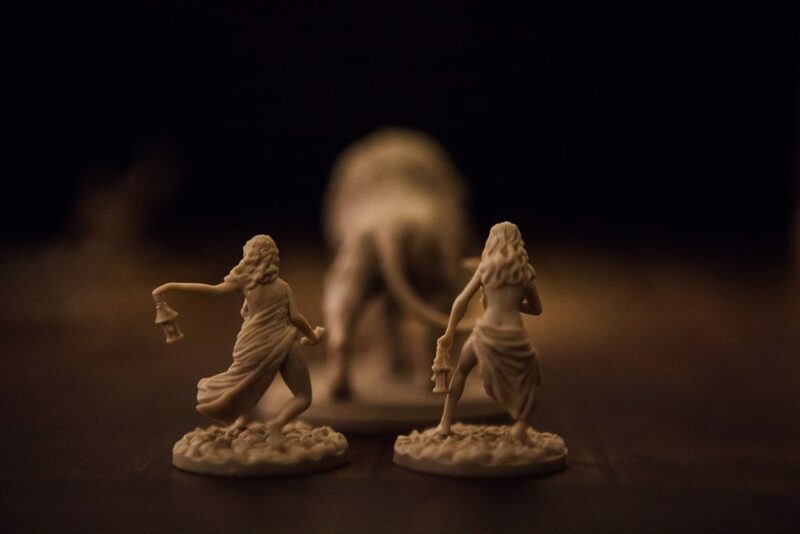 Statue moves into the tall grass, sending a well-aimed bone dart to damage the beast’s femur! Egwene hits the beasts ribs, wounding it and taking it down to its basic attack! 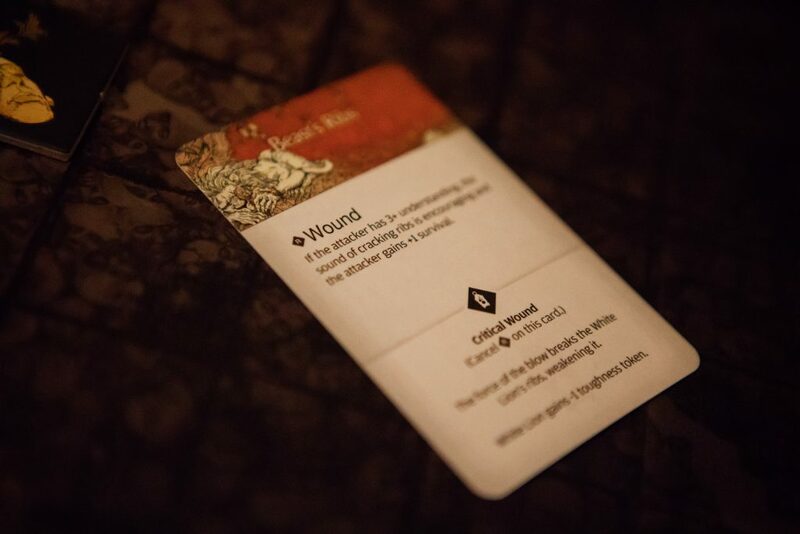 … and then a critical wound! 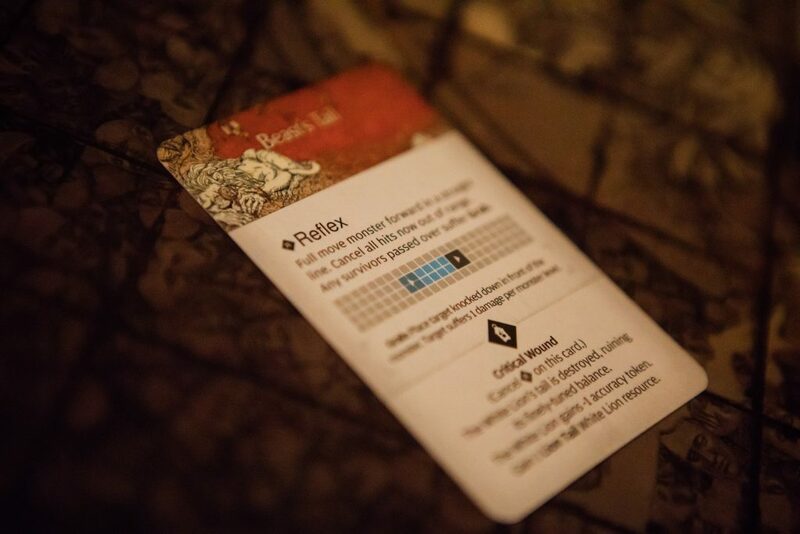 Not only do the survivors bag a load of Lion guts as goodies, the XP from the hunt triggers some ‘age’ story events. Egwene becomes a Clutch fighter, and Elayne becomes a Crossarm fighter! Enjoying our Kingdom Death Monster playthrough? Find more hilarious violence – and a new quarry – in Lantern Year Two!